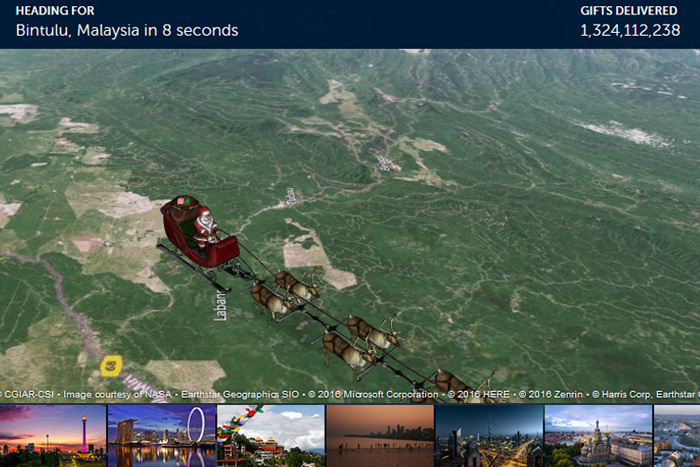 NORAD’s Santa Tracker went live as he took off from the North Pole last night — the kids can CLICK HERE to stream videos on the website as Santa makes his way over various locations. Photos and info about the Canadian-based fighter jet pilots who will be escorting Santa over North America can be found by CLICKING HERE. And most fun of all, one of over 1,500 live phone operators can be reached by dialing the toll-free number 1-877-Hi-NORAD (1-877-446-6723). They will be in radio contact with Santa (from their 2,000 sq. foot make-shift operations center at Peterson Air Force Base in Colorado), of course, but it’s unclear if they are able to take last minute gift requests … never hurts to ask though! For 60 years, NORAD and its predecessor, the Continental Air Defense Command (CONAD) have tracked Santa’s flight. The tradition began in 1955 after a Colorado Springs-based Sears Roebuck & Co. advertisement misprinted the telephone number for children to call Santa. Instead of reaching Santa, the phone number put kids through to the CONAD Commander-in-Chief’s operations “hotline.” The Director of Operations at the time, Colonel Harry Shoup, had his staff check the radar for indications of Santa making his way south from the North Pole. Children who called were given updates on his location, and a tradition was born.